Amid all the awards buzz around British actors this year, it’s heartening to see David Oyelowo finally get his due. After his electrifying turn as Forest Whitaker’s activist son in The Butler, it was only a matter of time before the Oxford-born actor got a lead role worthy of his talent. 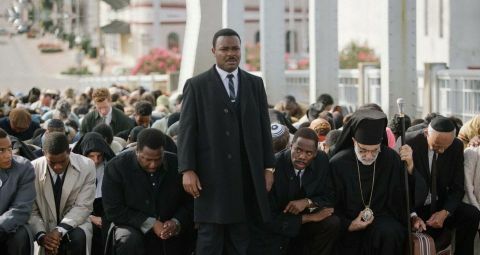 That comes in Selma, Ava DuVernay’s powerful picture set at the epicentre of the Civil Rights movement, with Oyelowo cast as Dr. Martin Luther King. A daunting challenge for any actor, Oyelowo rises to the task, in a film that eschews the traditional biopic approach. There are no scenes of King as a young boy or indeed of his assassination in 1968. Rather, it centres on a crucial moment four years earlier when King petitions President Lyndon B. Johnson (Tom Wilkinson) to ensure that black folk are able to use their right to vote in the newly de-segregated Southern states, rather than face intimidation at the polling booths. There’s particular focus on Alabama, run by the vile Governor George Wallace (Tim Roth), and the town of Selma, which emerges as the battleground for King to lead out his troops. A 50-mile, five-day march between Selma and Montgomery is planned, but when the police confront the non-violent protest on the Edmund Pettus Bridge, the result is sickening. DuVernay essays a vivid, but never exploitative, command of scenes of tension and trauma. Oyelowo, DuVernay and British scribe Paul Webb work their fingers to the bone ensuring that their presentation of King is not simply icon-making. Here, we very much glimpse the man behind the myth, raking over his less-than-stable personal life with wife Coretta (fellow Brit and The Purge: Anarchy star Carmen Ejogo) as much as his abilities in public. True, there are one too many rousing speeches to be heard throughout the film, though Oyelowo delivers with such devastating force, it’s hard not to be swept up by him. The support cast is also formidable. Cuba Gooding Jr., Alessandro Nivola, Giovanni Ribisi, Martin Sheen and Oprah Winfrey, who also produces here, give everything, even if appearing briefly, though it’s the little-known Nigel Thatch that trumps them all in his one remarkable scene as Malcolm X – the agitator to King’s negotiator. Perhaps the biggest star, however, is DuVernay; with just two previous films behind her (the little-seen I Will Follow and Middle Of Nowhere), this is a hugely impressive achievement.